Last night my friend Nici hosted a girl’s grill and salad gathering. She has a fabulous garden overflowing with salad greens right now, so she wanted to share the wealth. As guests, all we needed to bring was something to throw on the grill. The problem was that I had these cherries sitting in my fridge giving me the overripe evil eye. What kind of delectable treat could I make with them for the party? 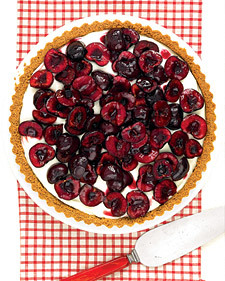 Then I remembered a recipe from my latest issue of Everyday Food, a fresh cherry tart that had made my mouth water. Now, lucky for me, it required no bake time, because it was of course, the last minute. (6:15 for a 6:30 party) So, I tossed the dog in the car and raced to the store with my recipe in hand. Now, the original recipe has you make and bake a graham cracker crust. I had no time for that, so I grabbed the pre-made graham crust. When I got home, this was crumbled into the bottom of a cute little serving piece and then I started in on the filling. It is also important to note that I have limited patience and a tendency to skim directions. This has been known to sabotage my efforts at times, but for some reason I keep on operating that way. This time, everything seemed to work out, despite my improvisations: I used the entire 8oz block of cream cheese rather then the recipes 6oz; bought a pint of heavy cream and just used the whole thing, rather then measure out the ¾ cup that was called for; and finally, my jar of vanilla just would not open, no matter how much I banged it on the counter, begged or pried. So, I skipped the vanilla and forged ahead. 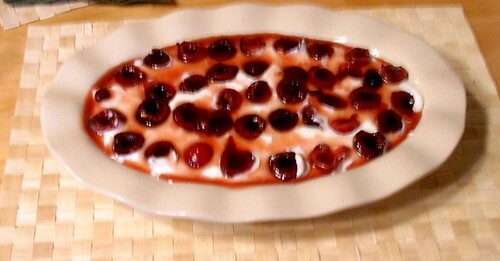 I quickly poured it over the crust, popped the cherries on top and drizzled the jam glaze over everything. It didn’t look quite as fabulous as Martha’s, but it looked pretty good for a 15 minute baking sprint. I grabbed my bag and headed out the door, walking the 4 blocks to Nici’s house to arrive only 20 minutes late and just in time for some good wine. We ended up having a really wonderful night, perfect weather, great conversation, lots of yummy food. And the tart pan was practically licked clean.. I am definitely going to put this in my stash of great party recipes. Martha comes through again! I was there and didn't move fast enough to get seconds! It was gone before you could say, "very cherry." Delicious, Amy.